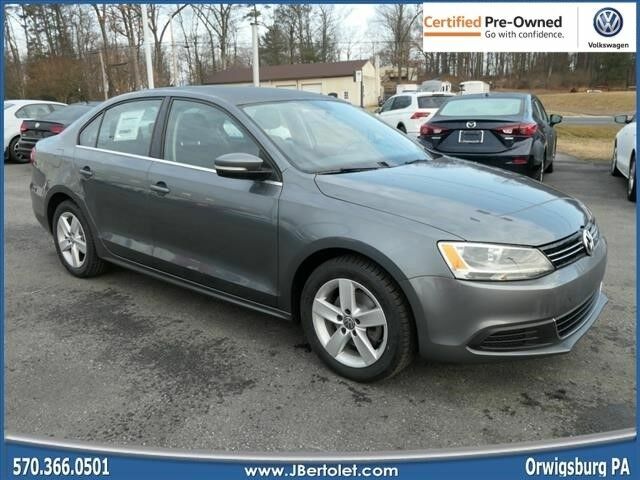 When you're ready to upgrade your ride, opt for this 2013 Volkswagen Jetta TDI, which includes features such as braking assist, stability control, traction control, Sirius satellite radio, AM/FM radio and CD player, anti-lock brakes, dual airbags, side air bag system, digital display, and airbag deactivation. This one's available at the low price of $12,495. This 4 dr sedan is one of the safest you could buy. It earned a crash test rating of 4 out of 5 stars. Fuel up with diesel and fill up less. Flaunting a timeless platinum gray exterior and a titan black interior. You'll enjoy crystal-clear sound with features like AM/FM radio and CD player. Interested? Don't let it slip away! Call today for a test drive. Contact Information: J Bertolet Volkswagen, 555 Rt 61, Orwigsburg, PA, 17961, Phone: (570) 366-0501, E-mail: johnbertolet@jbertolet.com. Here is what to expect when you shop for your next vehicle at J. Bertolet Volkswagen.... A hassle free no pressure test drive with a knowledgeable sales staff to answer all of your questions. Transparent up front prices with no hidden fees. Some cash offers are in lieu of special financing. Our sales price does not reflect sales tax, state title, and/or registration fees. We have no add on fees and do not require you to purchase anything extra to acquire our sale price. Stop in and see why a Bertolet VW is a better VW.